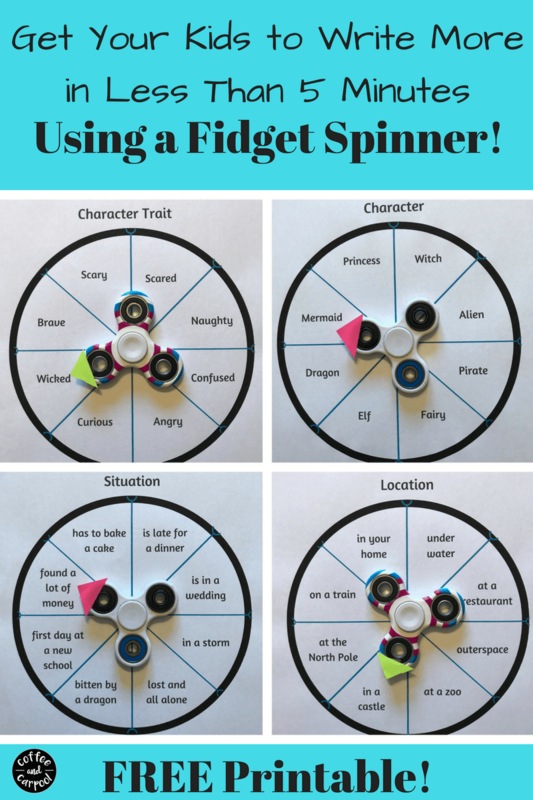 Inside: Need a great new fidget spinner activity to add to your lesson plans or home activity? 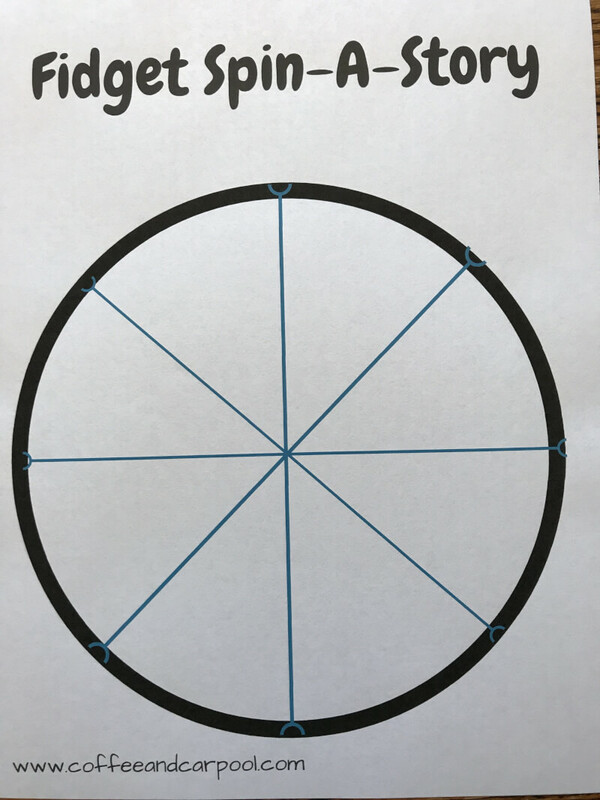 Free Printable to help your student write more with a fidget spinner. I used to love creative writing as a kid. I had a myriad of ideas and an old Trapper Keeper full of half written stories, including a Choose Your Own Adventure Book I wrote. But not all kids love creative writing. They groan and complain through the whole process, as I silently will them to love writing as much as I do. And every summer, to prevent the “summer slide,” I get my kids to write daily. But it can be painfully hard to come up with your own ideas as a writer. Especially when there’s a blank page in front of them. To foster creativity, self-expression, and overall writing skills, we must encourage our kids to creative write. So, I showed my kids how to write with their fidget spinners and all of a sudden, they were begging to write more stories. 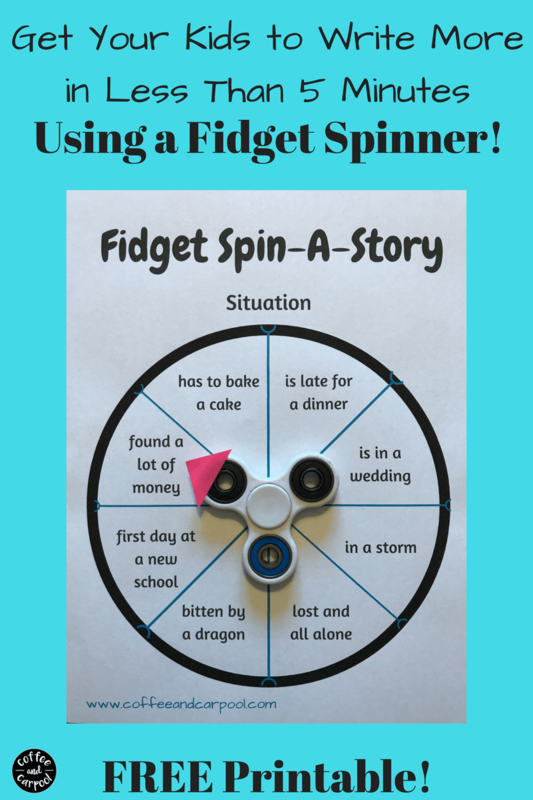 You can have your kiddo set up in just 3 easy steps with a Spin-a-Story. First things first. What goes into a story? There are 4 parts to a simple creative writing story. 1. All stories need a character. A protagonist. Someone who the story is going to be about. 2. Second, that character needs, well character. Are they scary? Are they scared? Do they never get scared even when they should be? 3. Next, we need to know where the story is taking place, the location, the setting. Are they somewhere realistic or somewhere completely bizarre and made up? 4. Last, there needs to be a problem or a situation. What happens in the story? What is the story all about? I’ve updated this to remove words we don’t quite use to describe people any more …don’t look too closely at some of the character traits! Or, print the FREE BLANK template so the writer can put in their own ideas. 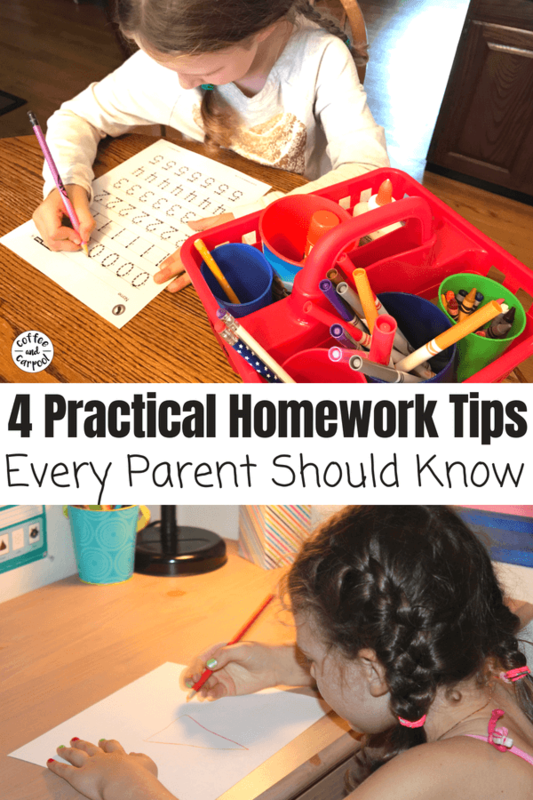 They can use their favorite TV, book, or movie characters to increase their interest! 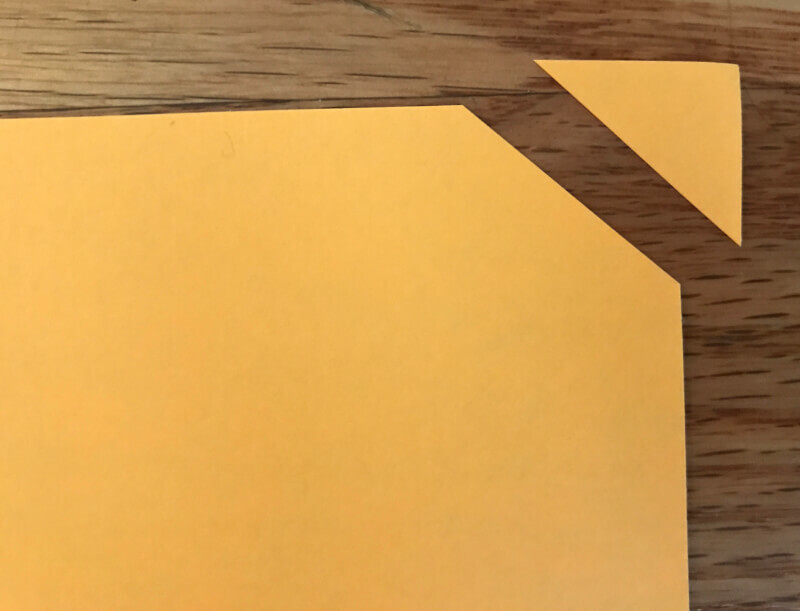 Cut off a corner of a piece of brightly colored paper and tape it onto the fidget spinner. 3. 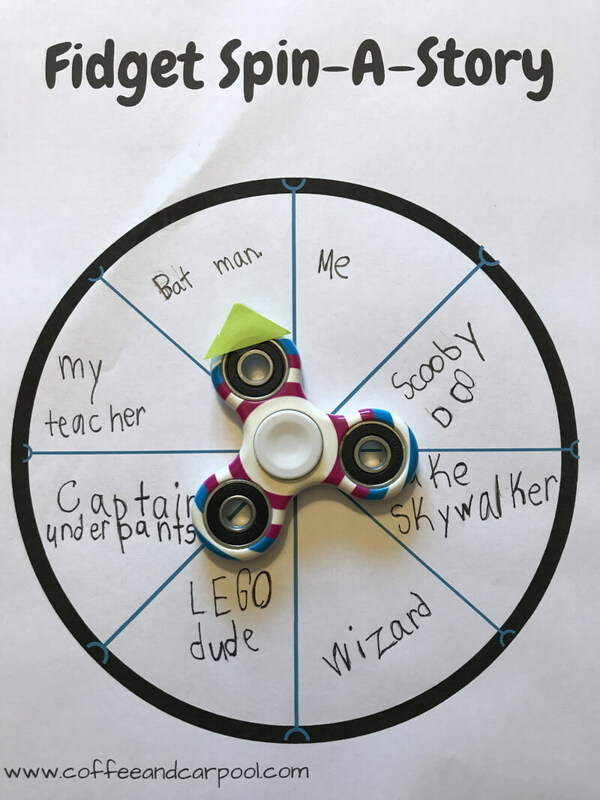 Place the fidget spinner in the middle of the circle and let your kiddo spin away to find out what they’re going to write about. Related: Need more reasons to use fidget spinners? 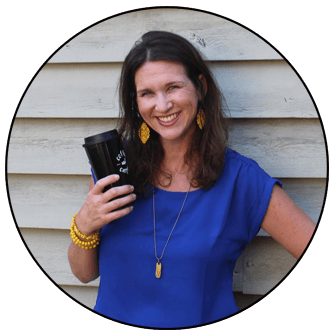 If Dayna at Lemon Lime Adventures can’t convince you, no one will. Then get down to the business of writing! No two stories will ever be the same. 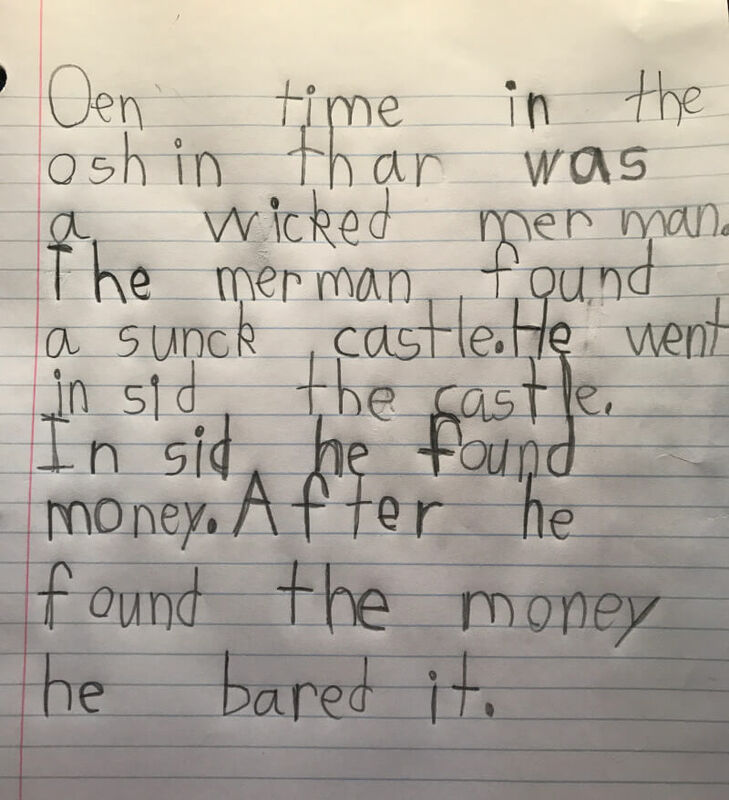 In this spin, my son will write a story about a wicked mermaid who found a lot of money while in a castle. How did she find the money? What is she going to do with it all? How much money are we really talking about? How in the world is she able to move around a castle with no legs? Will she become less wicked? Or will she stay wicked? How wicked? 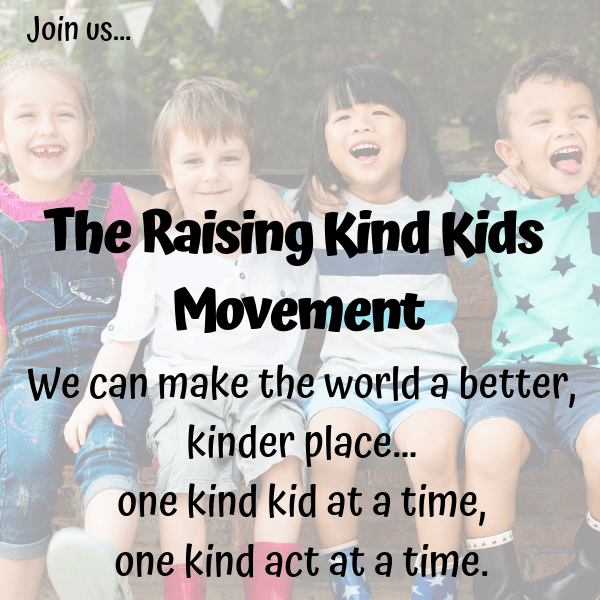 And if they’re still struggling with a lack of enthusiasm or inspiration, encourage them to write it with colored pens, type it on the computer, or even dictate it to you as you write down their words. 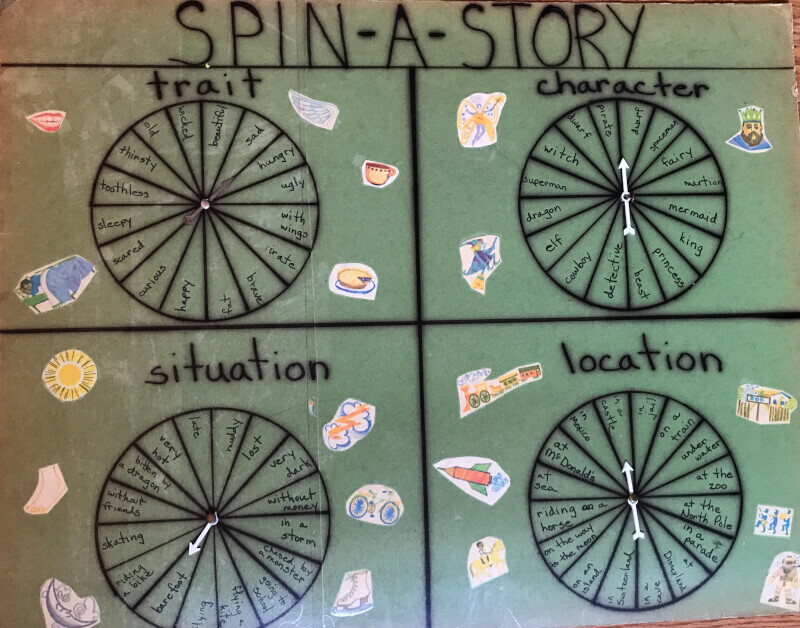 Spin the character twice and have the second character be the antagonist or “bad guy” of the story. Spin the trait wheel twice for each character. 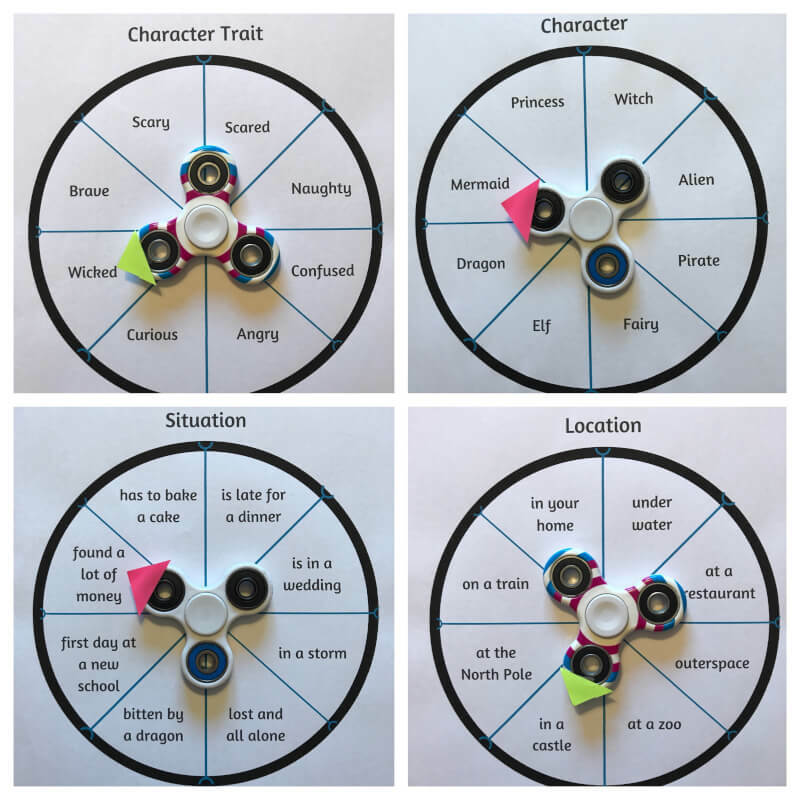 Spin the location wheel twice and have the characters travel from one location to the other. Add details to the story through editing by asking probing questions. I still want to know how much money we’re talking about! Have them draw a scene or scenes from their story. Longer stories can easily be turned into books. 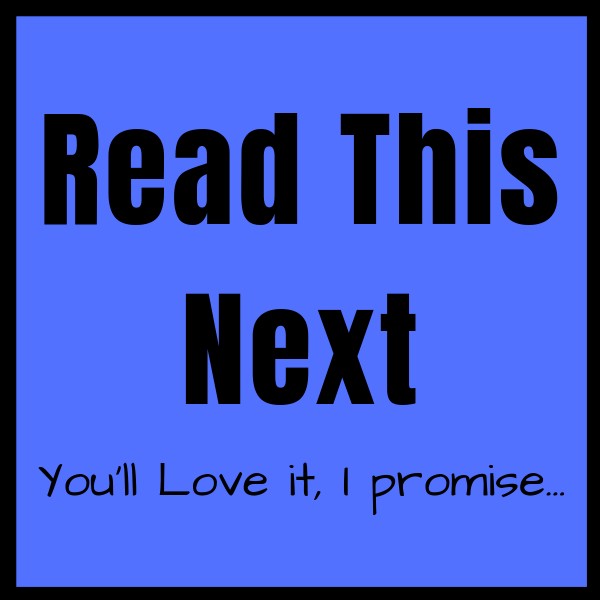 Published authors want to keep writing! It’s fun to read your own work and it’s definitely something to be proud of! It can be as simple as sheets of paper stapled together or use make your own book kits. Target often has a set of books for $3 in their Dollar Bin that we use often for our stories. Stock up when you see them! 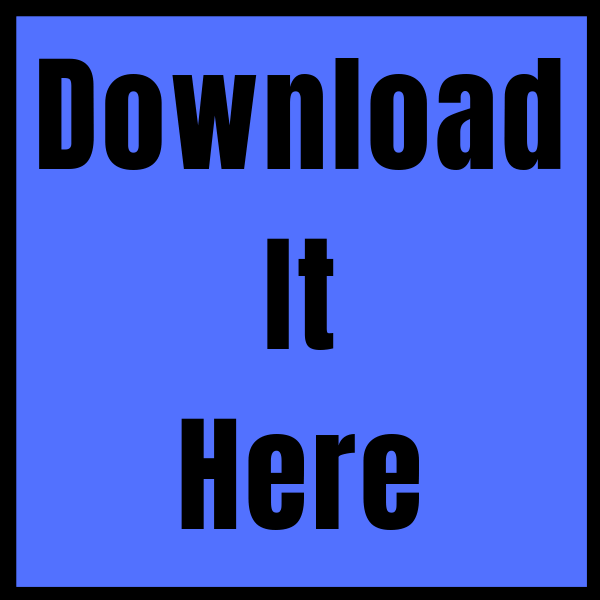 There are also several websites that will publish your children’s books. Whatever it takes to get their creative juices flowing. Whatever it takes to create more writers in this world. 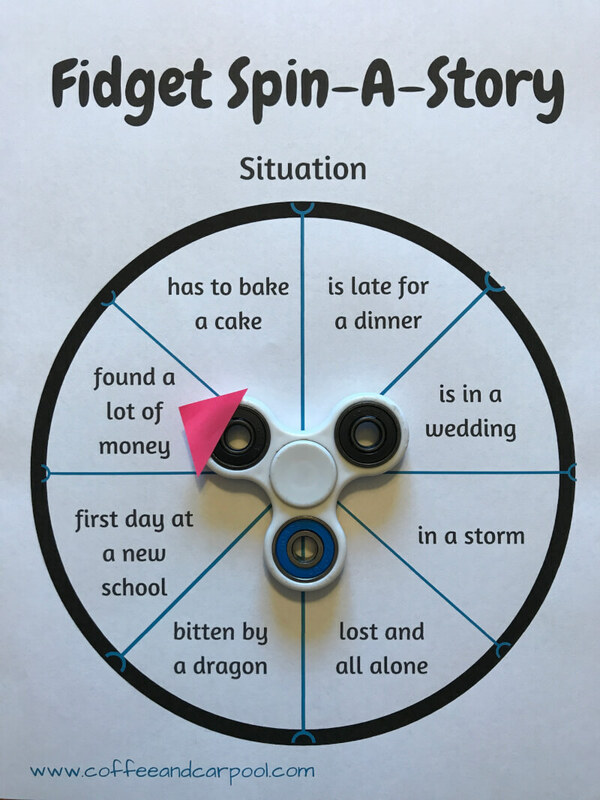 Download your Fidget Spinner Creative Writing Printables here.